We’re so thankful for Levi’s ears. Pioneer of the Ball of Wax Audio Quarterly, Levi Fuller, has been sharing the music he loves since 2005. And not only has he been sharing the music – he’s been documenting it – with homemade compilation CDs, complete with screen-printed artwork. Levi says he started Ball of Wax Audio Quarterly with “the idea of shedding light on and creating a document of some of the wonderful music that was being made all around me, much of which without any fanfare, press, or radio play”. With a new compilation released every three months and a live show to support each release, Levi has built a strong force of musicians and supporters alike – this May will be the release of Ball of Wax, Volume 24! (Levi is currently accepting submissions for Ball of Wax, Volume 24 until April 11th). 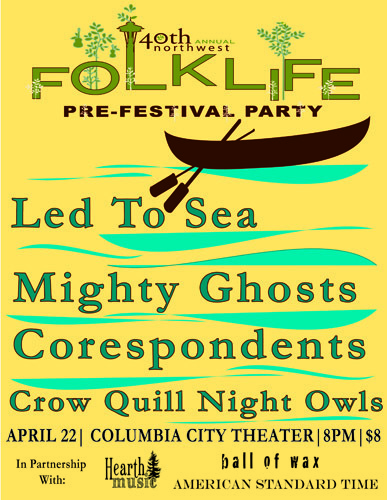 Folklife will be teaming up with Ball of Wax to introduce our newest stage, Indie Roots at the Folklife Pre-Fest Party on April 22nd at the Columbia City Theater. Ball of Wax bands, Led to Sea and Corespondents will be joined by the Crow Quill Night Owls and Mighty Ghosts for a night of celebration, good music and friends. Get your tickets here! Don’t miss the Ball of Wax showcase at the upcoming Folklife Festival, May 29th from 12:00 – 3:00 PM on the Indie Roots Stage featuring Levi Fuller, Shenandoah Davis, Joshua Morrison, Sunday Evening Whiskey Club and Pickwick. Comments: Comments Off on We’re so thankful for Levi’s ears.